No words today. Just a really simple light lunch, whipped up from (mostly) store cupboard basics. Enjoy! 1. 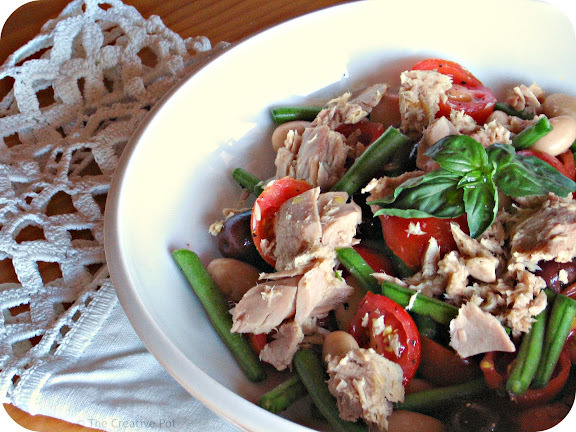 Toss beans, tomatoes and olive together in a salad bowl. Add tuna and gently stir through. 2. Drizzle oil and lemon juice over the salad, season to taste and scatter with basil. Gently toss to combine and serve immediately. Nothing wrong with store cupboard basics and definitely wrong with this salad!!! PS. I looked everywhere on Foodbuzz, I am looking for a long Foodbuzz leaderboard that runs across my site, like the one you have got!!! Seeing as how I detest mayo but love tuna...this salad would be ideal for me! Every where I go today, I am finding wonderful treats for my meatless lent - thanks for this. My new favourite food are butter beans, I seem to go through a tin on my own (blushing slightly)! Thank you for the recipe - yummy!